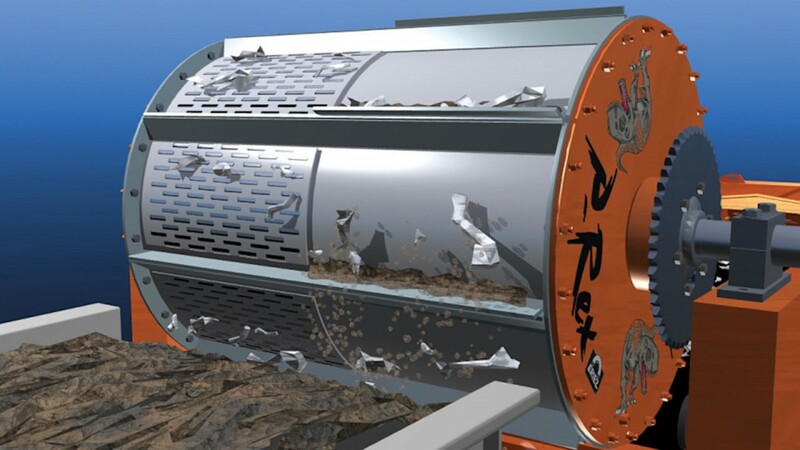 Recently introduced, the groundbreaking P-Rex84 Scrap Drum with Underflow Processing System (shown below) is the first-of-its-size offered to the industry, according to Eriez. This 84-inch by 60-inch drum utilizes revolutionary underflow processing in which fluff passes under the drum rather than rotating over it as it does in traditional processes. This modification greatly enhances fluff removal and metals recovery, generating increased profits for scrap yards. The P-Rex84 with Underflow Processing System is the latest development in Eriez' innovative scrap drum line. Eriez introduced the first P-Rex Scrap Drum at ISRI 2010. Since then, P-Rex has been successfully operating in numerous scrap yards, consistently delivering improved separation, greater revenue and reliable operation. Tim Shuttleworth, Eriez President and CEO comments on the new P-Rex84. "The standard over-the-drum processing approach is not very efficient for cleaning fluff out of the frag or ferrous product since most of the cleaning action is in a very narrow zone and some items cleaned from the frag actually fall back into the feed source," he says. "Conversely, when you go on the underflow of the drum, any fluff released from the ferrous product stays out of the ferrous product, enabling a 50 percent reduction in the amount of entrained fluff compared to over-the-drum processing." Additionally, according to Shuttleworth, engineering breakthroughs give P-Rex the advantage in critical performance areas: superior edge-to-edge separation, no ‘transfer point' drop in magnetic force and no decline in performance due to heat rise, as detailed below. With today's electromagnetic drum magnets, a steel core is used to project the magnetic field. These cores generate a limited magnetic force at the drum edge because the electric coil that is wound around the core takes valuable space across the width of the drum, resulting in weak zones at the edges. These weak zones can amount to 20 percent or more of the surface of the drum. Because the P-Rex is a permanent magnet, it extends to the edge of the drum. That equates to wider and more efficient separation. Wider separation means greater profits through greater recovery. Today's design of electro-axial drums have a significant reduction in magnetic strength at the transfer point, or "flip" point, along the arc of the ferrous material's travel, causing lost recovery. Not with the P-Rex. The ferrous material is powerfully transferred and flipped from magnetic pole to magnetic pole to magnetic pole, resulting in a cleaner product and more recovery. Electro Drums consume power and heat up much like a light bulb does during use. The higher the heat, the greater is the loss in strength. Mike Shattuck, Market Manager—Recycling Equipment, explains, "Check the gauss strength of your drum at the end of the shift and you will see that the electro drum has lost up to 30 percent of its strength." He adds, "In the summer and in southern climates, this can be an even greater issue." P-Rex's permanent magnets are permanent; they maintain their strength. Unlike electromagnetic drums, P-Rex uses no electricity. It is very strong with an attractive force that surpasses the largest and strongest electro drums on the market today. When comparing P-Rex Drums to Electros, P-Rex outperforms them by more than 20 percent in both hot and cold conditions. When drum magnets don't operate at peak performance, large sphere-shaped meatballs and knuckles become impossible to capture. Fragments of electric motors and alternators and other items containing copper, aluminum and steel are missed, money is lost and dangerous fluff fires often result. With PRex, this is not an issue. Eriez will be on hand at ISRI 2019, in Los Angeles, California, April 8-11, in booth # B2.